High performance NAECOMET® Silver Semi-Refractory composite materials bridge the gap between traditional silver alloys and refractory powder-met materials. Combining properties from both, these materials resolve many of the arcing, welding, and wear issues often encountered in electrical design. NAECOMET Silver Metal Oxide contact materials meet the challenges of contact arcing with resistance to arc erosion, anti-welding properties and high electrical conductivity. 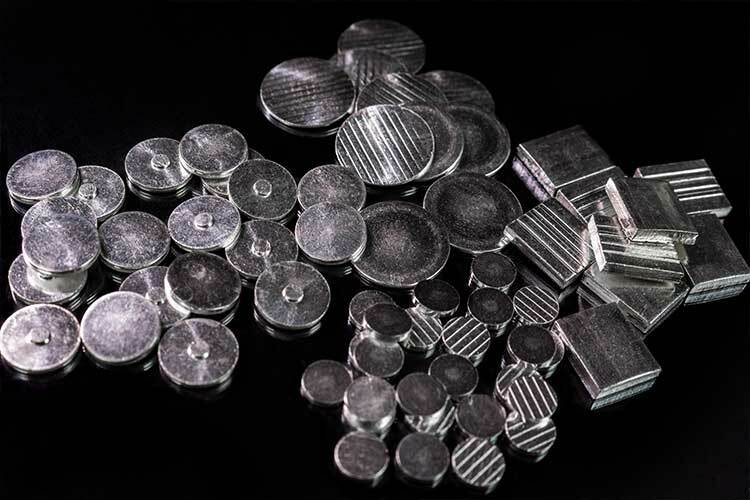 Environmentally friendly Silver Tin Oxide materials are increasingly used in industrial control applications while Silver Cadmium Oxide materials have been used successfully in aerospace and other applications for decades. 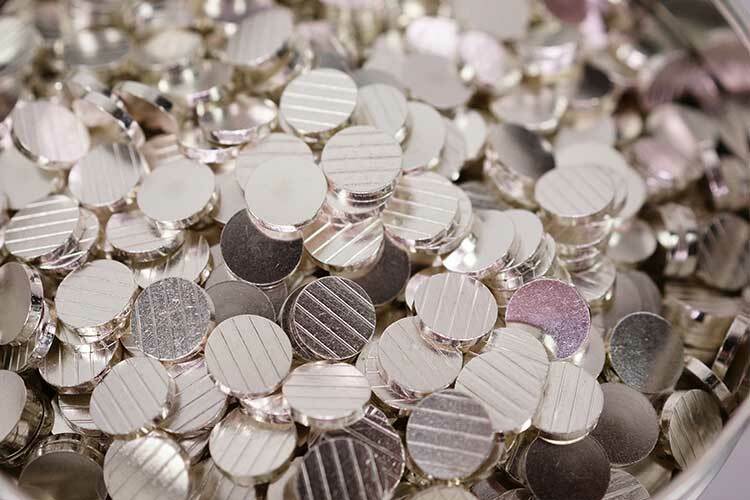 Silver Nickel contact materials have good ductility and offer higher resistance to mechanical wear than Fine Silver. NAECOMET Silver Graphite contacts combine high conductivity with good lubrication properties and reduce the tendency for galling and scoring in sliding contact applications. NAECOMET D-54® 90% Silver / 10% Cadmium Oxide. Powder Metallurgy. NAECOMET P88 88% Silver / 12% Cadmium Oxide. Powder Metallurgy. NAECOMET D-55 85% Silver / 15% Cadmium Oxide. Powder Metallurgy. NAECOMET D-355 80% Silver / 20% Cadmium Oxide. Powder Metallurgy. NAECOMET PX90 90% Silver / 10% Cadmium Oxide. Extruded Powder Metallurgy. NAECOMET PX88 88% Silver / 12% Cadmium Oxide. Extruded Powder Metallurgy. NAECOMET PX85 85% Silver / 15% Cadmium Oxide. Extruded Powder Metallurgy. NAECOMET PX80 80% Silver / 20% Cadmium Oxide. Extruded Powder Metallurgy. NAECOMET D-54F 90% Silver / 10% Cadmium Oxide, Internally Oxidized (AKA: Pre-Oxidized). NAECOMET I865 86.5% Silver / 13.5% Cadmium Oxide, Internally Oxidized (AKA: Pre-Oxidized). NAECOMET D-55F 85% Silver / 15% Cadmium Oxide, Internally Oxidized (AKA: Pre-Oxidized). NAECOMET D-355F 80% Silver / 20% Cadmium Oxide, Internally Oxidized (AKA: Pre-Oxidized). NAECOMET D-54X 90% Silver / 10% Cadmium Oxide, Externally Oxidized (AKA: Post-Oxidized). NAECOMET 865E 86.5% Silver / 13.5% Cadmium Oxide, Externally Oxidized (AKA: Post-Oxidized). NAECOMET D-55X 85% Silver / 15% Cadmium Oxide, Externally Oxidized (AKA: Post-Oxidized). NAECOMET D-355X 80% Silver / 20% Cadmium Oxide, Externally Oxidized (AKA: Post-Oxidized). NAECOMET SR8 92% Silver / 8% Tin Oxide, (Copper additive). NAECOMET SR10 90% Silver / 10% Tin Oxide, (Copper additive). NAECOMET SR12 88% Silver / 12% Tin Oxide, (Copper additive). NAECOMET SM8 92% Silver / 8% Tin Oxide, (Molybdenum additive). NAECOMET SM10 90% Silver / 10% Tin Oxide, (Molybdenum additive). NAECOMET SM12 88% Silver / 12% Tin Oxide, (Molybdenum additive). NAECOMET SB8 92% Silver / 8% Tin Oxide, (Bismuth additive). NAECOMET SB10 90% Silver / 10% Tin Oxide, (Bismuth additive). NAECOMET SB12 88% Silver / 12% Tin Oxide, (Bismuth additive). NAECOMET SB14 86% Silver / 14% Tin Oxide, (Bismuth additive). NAECOMET D510F 90% Silver / 10% Nickel, Extruded Powder Metallurgy. NAECOMET D50F 85% Silver / 15% Nickel, Extruded Powder Metallurgy. NAECOMET N800 80% Silver / 20% Nickel, Extruded Powder Metallurgy. NAECOMET D56 70% Silver / 30% Nickel, Powder Metallurgy. NAECOMET N600 60% Silver / 40% Nickel, Work Hardened Powder Metallurgy. NAECOMET GR2 98% Silver / 2% Graphite, No specific graphite orientation required. NAECOMET GR3 97% Silver / 3% Graphite, No specific graphite orientation required. NAECOMET D58 95% Silver / 5% Graphite, No specific graphite orientation required.